Was the Cincinnati Zoo right to shoot this gorilla, to protect the four year old boy who fell into the gorilla exhibit? Was Harambe, caught on a video that quickly went viral, protective or menacing? Should the parents of the young boy be held accountable in some way? Is the public/media attention to the parents’ unusual and/or racist? Is the zoo at fault for making a flimsy exhibit that children can fall/climb into? What can be done to prevent this next time? Few people, from my eyes, are seeing the real problem that led to this tragedy — although I’m delighted to see it covered in Scientific American, most people are still stuck on CNN. Oh, there have been arguments from experts — ex zookeepers have assessed Harambe’s posturing as threatening, while world renowned primatologists like Jane Goodall and Frans de Waal see potentially protective behavior toward the child (while others have turned to celebrity non-experts like Jack Hanna) in the Harambe video. The zoo, through director Thane Maynard, defends the decision to shoot Harambe rather than use tranquilizers. Harambe’s former zookeeper Jerry Stone says Harambe was never aggressive to humans, but the gorillas in Harambe’s family will be fine after his death. Does it matter if we punish parents? Legally, there is an interesting theory to be brought by holding humans responsible for human-animal conflicts that result in the death of an endangered animal. But does the blame rest with the parents or the zoo or something else…? (and by the way, anyone who pretends they haven’t ever lost sight of their four year old temporarily is probably being a little dishonest). Is the zoo legally accountable for building a proper enclosure that ensures reasonable safety, both for the animals and for the spectators? Certainly the zoo is under legal obligation to protect human spectators from wildlife and to protect wildlife from humans. And they should be held legally accountable for not adequately protecting Harambe from an encounter like this. But does this get at the larger issue – the issue that time and again results in either human or nonhuman animal death in these situations? Does it matter if Harambe was being protective or threatening? As Goodall noted, a toddler fell into a gorilla exhibit at Illinois’ Brookfield in 1996 and the female gorilla, Binta Jua, in that exhibit protected him and handed him to paramedics. Harambe weighed more than 400lbs. 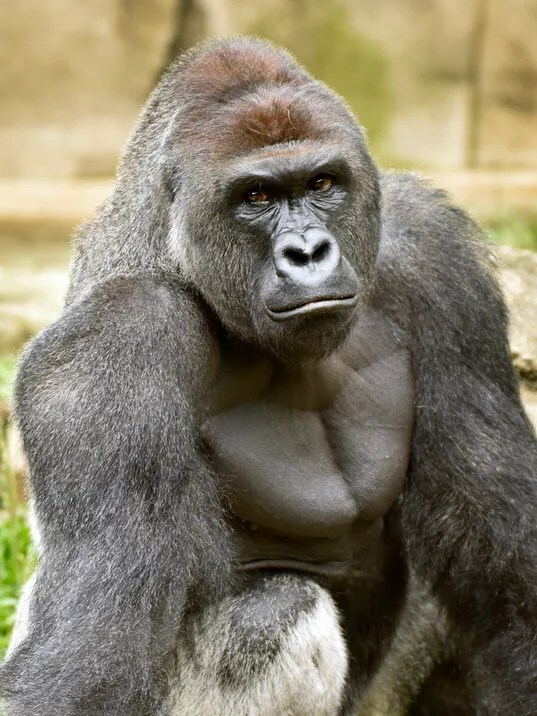 Silverback male gorillas are unimaginably strong, and the only way we can convey that strength, apparently, is to say Harambe had the strength of ten men. In one instant, Harambe could have thrashed the child, dragged him through the water again, cracked him like a pistachio with a flick of his hand, whether intentionally or unintentionally. Of course, he could have held him like a child, traded him for food, or decided to take a nap. But no amount of tranquilizer would have slowed him immediately. A decision was made. But that decision was made long ago, the moment the zoo was created and captive gorillas were bred for the profit of the zoo, the delight of human spectators, and the alleged conservation of an endangered species. We MUST recognize that in a perceived human-animal conflict with even a possibility of human fatality, all measures, including lethal, will be taken immediately. This is true in almost any situation, and this is true in any situation of capitivity. It is certainly true in zoos, theme parks, and even national parks. If we fail to realize or change this, it will simply continue to happen. Wildlife will be killed, trainers will be killed, and spectators may also be killed. That is the cost of captivity. So it is disappointing to see people arguing over whether or not he should have been shot, or who is to blame for the child being in the exhibit. Who is to blame for Harambe being in the exhibit? That blame, to a degree, falls upon all of our shoulders. Harambe was a 17-year old lowland mountain gorilla, born and raised in the zoo’s captive breeding program for western lowland gorillas, who are endangered. 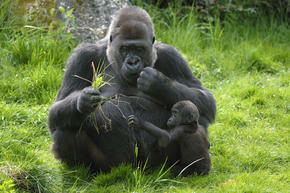 Silverback male gorillas are ferociously, endearingly protective of their families. They are vegetarian, they are incredibly intelligent, funny, strong and fascinating. We share almost all of our genetic with gorillas, as we do with chimpanzees. Learn more about gorillas here. If you want to conserve endangered wildlife, the very last thing you should do is support zoos. Stop buying any product with palm oil. Focus attention (and urge others, including our political leadership) to spend more attention on African nations, and help encourage tourism to these nations, help fight poaching, help protect natural habitats and support wildlife preserves, and spread the message of education through documentaries and film. Not zoos. You cannot truly make a claim about wanting to protect an endangered lowland gorilla while doing absolutely nothing to help protect their native, natural habitat. At what cost are we conserving a species if it means breeding for profit and holding them captive in unnatural, dangerous, exposed cages on constant display? (can you hear the constant noise captured on the Harambe video even before the manic screaming begins?) These wild animals are totally at the mercy of human decisions, actions, and mood for everything from who they have as friends and family members to daily food. Otherwise, it’s like saying you want to protect your grandmother’s safety by putting her in San Quentin and letting your friends burn her home to the ground. We all want to be close to the wild – and touch the wild within. When we see these magnificent animals in zoos we are filled with awe and we want to be able to see them and for others to see them. That is what keeps zoos alive, and it is an understandable desire. The problem is the idea that we deserve to see exotic wildlife in zoos is truly entitled. I grew up in California. If I don’t travel to Central Africa in my lifetime to see a gorilla in the wild, then that’s the way it goes. That doesn’t mean the San Francisco zoo should breed gorillas so I too can encounter gorilla existence. Intelligent primates like chimpanzees, orangutans and gorillas suffer so much many are essentially brain damaged by the conditions of their confinement. I wouldn’t want my child to see that, nor would I support that financially (nor would I blame the zookeepers), nor would I see that as in any way supporting and protecting the species by having these poor animals confined in prison. Make no mistake: a wild animal in captive conditions is no more representative of his species than a human locked in prison. What would it teach our child about humanity and human experience to visit a prison inmate? Nothing I want my child to know, and I don’t want my children to see animals imprisoned for our profit and entertainment. The 2013 documentary Blackfish also rocked the nation, drawing attention to the plight of animals in captivity. The film investigates the captivity of an orca named Tilikum whose conditions of captivity at SeaWorld lead to the death of several humans, including trainer Dawn Brancheau. What shocks people who watch this film is the dark world of suffering endured by Tilikum and the very real hazards of working with wild animals, all hidden in the bright display of whale shows at SeaWorld. We don’t realize how awful it is to imprison wildlife until we finally do. We take for granted that wildlife belong in theme parks and in zoos, and that it is our right to see them displayed. That they have good lives, that they aren’t suffering, that they like their unnatural conditions which are often legally inadequate and psychologically harmful, limited space enclosures, forced interactions with non family members or total isolation, and constant display for gawking and sometimes aggressive human beings. Remember Tatiana, the female Siberian tiger at the San Francisco zoo who was tormented by teenage boys until she leapt out of her enclosure, mauled them, and was killed by the San Francisco police? I do. And I remember seeing similar drunken human beings tormenting a tiger at a zoo near my home in Indiana. We’ve all seen videos with people mocking distressed animals who have no escape, no escape, from taunting. We’ve all been in situations that are crowded, noisy, unnatural, dangerous, stressful – and we can escape. Is it right to imprison wild animals so that their entire well-being is at our mercy? Have we conserved a species if they can only exist in prison with our “help”? It is very easy to continue business as usual, without questioning what we take for granted – which is whether it is okay to use, confine, display, and breed for profit, animals who are wild. It is easy to continue spending private and public funds to build zoos, as we do to build human prisons too, and indulge in our desire to see beautiful baby animals from only a matter of yards away. It is easy to think that is normal, and easy to think that we have the right to do that. It is even easier to say that is conserving the species. It is much harder – and more moral, more effective, and more honest – to actually protect the species. And it is easy to lash out and play the blame game as long as it means not changing any of our own behavior and assumptions. Want to help protect endangered mountain gorillas? Help stop poaching and support the badass anti-poaching movement and the humans who put their very lives in danger every second to protect wildlife like gorillas, rhinos and elephants. It is outrageous for zoos and trophy-hunters to call themselves conservationists while people are literally in the jungle risking brutal torture and death by stepping in the way of poachers. What else can we do? Stop blackmarket trafficking. Encourage economic support and business development in suffering African nations. Ensure medicinal availability to stop the spread of ebola. 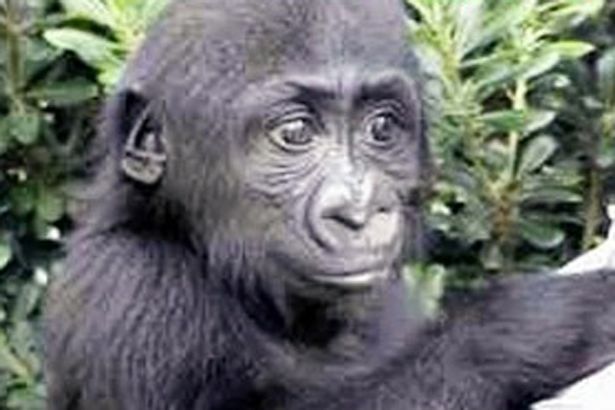 Campaign against gorilla bushmeat and provide alternatives. Don’t be fooled by zoo marketing or think you are too far away to do something. There are 880 mountain gorillas on the planet. Don’t imprison them, don’t ignore them, don’t forget them. Demand we do better by them. Stop visiting zoos and fight for the end to captive breeding – a system that means animals are forcibly bred and raised their entire lives in captivity. Encourage zoos to be sanctuaries – places of refuge for wildlife – without breeding. Wouldn’t you rather your child visit a wild animal in a somewhat wild environment knowing that place is a sanctuary, rather than an entertainment zoo? Protecting endangered wildlife means protecting wild habitat, and to do that we are going to have to get a lot more invested in wildlife than simply screaming on Facebook or CNN about one, tragic instance as if it isn’t fundamentally representative of animal captivity as a whole. As long as we visit zoos, circuses, and theme parks and exploit wild animals for our entertainment as if we are Roman demigods enjoying the slaughter of barbarians, the suffering and death of animals like Harambe will continue. And nothing of real merit will be done to conserve their species from human consumption, greed, and violence. Support the GorillaFund (in Dian Fossey’s honor) for Father’s Day by adopting a WILD mountain gorilla.